Այս ուղղության հետազոտությունները հիմնականում նվիրված են վիճակագրական վարկածների տեստավորման խնդիրներին: Ստացված արդյունքները և առաջիկա ուսումնասիրությունները վերաբերում են հետևյալ խմբերին. Գիտական ուղղության նպատակն է բազմամասշտաբ և բարդ ֆիզիկա-քիմիական ընթացքների տեսական, ալգորիթմական և թվային հետազոտություններ: Մասնավորապես, կատարվում են. E. Haroutunian, M. Haroutunian and A. Harutyunyan, “Reliability criteria in information theory and in statistical hypothesis testing”, Foundations and Trends in Communication and Information Theory, vol. 4, issue 2-3, 2008. E. Haroutunian, M. Haroutunian and N. Afshar, “Random coding bound for E-capacity of the wiretap channel”, Proceedings of International Conference Computer science and information technologies CSIT 2011, pp. 121-124, Yerevan 2011. E. Haroutunian, M. Haroutunian and N. Afshar, “Random coding bound for secrecy E-capacity region of the broadcast channel with two confidential messages”, Mathematical Problems of Computer Science, vol. 36, pp. 79-90, 2012. M. Haroutunian, A. Muradyan, and L. Ter-Vardanyan, “Some numerical represen-tations on biometric identification system”, Proceedings of Intern. Conf of Information Engineering, WCE London, 2012. M. Haroutunian, A. Muradyan, and L. Ter-Vardanyan, “Upper and lower bounds of biometrical identification E-capacity”, Mathematical Problems of Computer Science, vol. 37, pp. 7-16, 2012. M. Haroutunian, and L. Ter-Vardanyan, “Information-theoretic approach to biometric identification problem”, Mathematical Problems of Computer Science, vol. 38, pp. 56-58, 2012. E. Haroutunian, M. Haroutunian and N. Afshar, “Random coding bound for E-capacity region of the broadcast channel with confidential messages”, Comunications in Information and systems, no. 2, pp. 131-156, 2012. E. Haroutunian, M. Haroutunian and N. Afshar, “On inner bound for E-capacity region of the broadcast channel with confidential messages”, 20th Telecommunications Forum Telfor, (TELFOR), pp. 522-524, 2012. 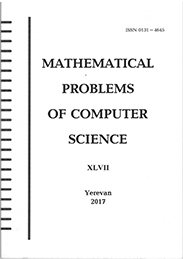 M. Haroutunian and N. Pahlevanyan, “Information theoretical analysis of biometric generated secret key sharing model”, Mathematical Problems of Computer Science, v. 42, pp. 17- 27, 2014. M. Haroutunian and N. Pahlevanyan, “Experimentation of advanced Inftheo module for R on the example of biometric generated secret key sharing system”, International Journal Information content & processing, vol. 2, no. 1, pp. 62-70, 2015. E. Haroutunian and A. Yessayan, “On Reliability approach to multiple hypotheses testing and to identification of probability distributiions of two stochastically related objects”, Proseedings IEEE International Symposium on Information Theory, Sant Peterburg, pp. 2671—2675, 2011. A. Yessayan, E. Haroutunian and P. Hakobyan, “Error probability exponents in testing of many hypotheses for two independent objects. ", Transactions of IIAP of the NAS of RA, Mathematical Problems of Computer Sciences, vol. 35, pp. 33--36, 2011. E. Haroutunian, P. Hakobyan and A. Yessayan, “Many hypotheses LAO testing with rejection of decision for arbitrarily varying object", Transactions of IIAP of the NAS of RA, Mathematical Problems of Computer Sciences , vol. 35, pp. 77--85, 2011. E. Haroutunian, P. Hakobyan and A. Yessayan, “On multiple hypotheses LAO testing with rejection of decision for many independent objects", Proceedings of International Conference CSIT 2011, pp. 117--120, Yerevan 2011. F. Hormozi-nejad, E. Haroutunian and P. Hakobyan, “On LAO testing of multiple hypotheses for the pair of families of distributions”, Proceedings of International Conference CSIT 2011, pp. 135--138, Yerevan 2011. A. Yessayan, “Computations of reliabilities interdependencies for optimal hypothesis testing of distributions for pair of statistically dependent objects”, Mathematics in Higher School, vol. 7, no. 2, pp 5—9, Yervan, 2011. E. Haroutunian, P. Hakobyan and F. Hormozi nejad, “On two-stage logarithmically asymptotically optimal testing of multiple hypotheses concerning distributions from the pair of families”, Transactions of IIAP of the NAS of RA, Mathematical Problems of Computer Sciences , vol. 37, pp. 25--34, 2012. E. Haroutunian and P. Hakobyan, “On Neyman-Pearson principle in multiple hypotheses testing”, Transactions of IIAP of the NAS of RA, Mathematical Problems of Computer Sciences , vol. 40, pp. 34--38, 2013. E. Haroutunian, A. Martirosyan and A. Yesayan, “On application of optimal multihypothesis tests for the bounds construction of stock market” Transactions of IIAP of the NAS of RA, Mathematical Problems of Computer Sciences , vol. 40, pp. 23--30, 2013. E. Haroutunian, I. Safaryan, H. Petrosyan and A. Gevorkyan, “On identification of anomalies in multidimensional hydrogeochemical data as earthquake precursors”, Transactions of IIAP of the NAS of RA, Mathematical Problems of Computer Sciences, vol. 40, pp. 76--84, 2013. E. Haroutunian and P. Hakobyan, “Multiple objects: error exponents in hypotheses testing and identification”, Lecture Notes in Computer Science, Ahlswede Festschrift LNCS vol. 7777, Springer Verlag, pp. 313-345, 2013. E. Haroutunian, P. Hakobyan and F. Hormozi nejad, “On Two-stage LAO testing of multiple hypotheses for a pair of families of distributions”, International Journal of Ststistics and Econometrics Methods, vol. 2, no. 2, pp. 127--156, 2013. E. Haroutunian, P. Hakobyan and A. Yessayan, “On LAO two-stage Testing of Multiple Hypotheses Concerning Markov Chain”, Transactions of IIAP of the NAS of RA, Mathematical Problems of Computer Sciences , vol. 41, pp. 63--73, 2014. E. Haroutunian, I. Safaryan, A. Nazaryan and N. Harutyunyan, “Detection of heterogeneity in three-dimensional data sequences: algorithm and applications”, Transactions of IIAP of the NAS of RA, Mathematical Problems of Computer Sciences, vol. 42, pp. 63--72, 2014. E. Haroutunian and P. Hakobyan, “Most powerful test for multiple hypotheses”, Proceedings of International Conference Computer Science and Information Technologies, pp.110—112, 2015. E. Haroutunian, I. Safaryan and N. Harutyunyan, “Using rank tests and threshold copulas for classification of multidimensional data sets”, Proceedings of International Conference Computer Science and Information Technologies, pp. 113—114, 2015. R. Sh. Sargsyan, A. S. Gevorkyan, et al., “Bioscope: new sensor for remote evaluation of the physiological state of biological system”, Edited by J. Bonca and S. Kruchinin, Proceedings of NATO ARW Physical properties of nanosystems, IOS, Press, 2011, p.299-309. R. Sh. Sargsyan, G. G. Karamyan, A. S. Gevorkyan et al., “Nonlocal interactions between two spatially divided light fluxes”, AIP Proc. of the International Conference on Advances in Quantum Theory, N1327, pp. 465-471, (2012). A. S. Gevorkyan, H. G. Abajyan and H. S. Sukiasyan, “A new parallel algorithm for simulation of spin-glass systems on scales of space-time periods of an external field”, Journal of Modern Physics, vol. 2, no. 6, pp. 488-497, (2011). A. S. Gevorkyan, H. G. Abajyan and H. S. Sukiasyan, “A new parallel algorithm for simulation of spin-glasses in external fields”, Proceedings of 34th International Convention of Information and Communication Technology, Electronics and Microelectronics: Grid and Visualization Systems conference, pp. 231-235, (2011). A. S. Gevorkyan and A. A. Gevorkyan, “Maxwell electrodynamics subjected to quantum vacuum fluctuations”, Physics of Atomic Nuclei, vol. 74, No. 6, pp. 901–907 (2011). A. S. Gevorkyan, H. G. Abajyan, E. A. Ayryan, “On modeling of statistical properties of classical 3D spin glasses”, Bulletin of PFUR. Series Mathematics. Information Sciences. Physics, no. 4, pp. 91-103, (2011). A. S. Gevorkyan and H. G. Abajyan, “On the description of a frustrated classical system within the conception of probability foundations”, Foundation of Probability and Physics, AIP Conf. Proc., N 1424, pp. 95-104 (2012). Doi:10.1063/1.3688957. A. S. Gevorkyan and H. G. Abajyan, “A new parallel algorithm for simulation of spin glasses on scales of space-time periods of external fields with consideration of relaxation effects”, Physics of Particles and Nuclei Letters, 9, No. 6–7, pp. 530–540 (2012). E. A. Ayryan, A. S. Gevorkyan and L. A. Sevastyanov, “A new dynamical system on the potential energy hypersurface of the classical three body problem”, Physics of Particles and Nuclei Letters (2013), 2013, Vol. 10, No. 7, pp. 1–8. A. S. Gevorkyan, “On reduction of the general three-body Newtonian problem and the curved geometry”, Journal of Physics: Conference Series 496 (2014) 012030 doi:10.1088/1742-6596/496/1/012030. A. S. Gevorkyan et al., “On reduction of NP hard problem to the P problem on the example of 1D spin glasses”, ICM-2014, 13 - 21 August, 2014, Seoul, Korea. A. S. Gevorkyan and V. V. Sahakyan, “Statistical properties of 1D spin glasses from first principles of classical mechanics”. arXiv:1512.04044 [cond-mat.dis-nn]. A. S. Gevorkyan, “On the motion of classical three-body system with consideration of quantum fluctuations”. arXiv:1512.01823v1 [math-ph]. E. A. Ayryan, A. S. Gevorkyan and V. V. Sahakyan, “New algorithm for simulation of 3D classical spin glasses under the influence of external electromagnetic fields”, Physics of Particles and Nuclei Letters, 2015, Vol. 12, No. 3, pp. 380–384. A.S. Gevorkyan, K.B. Oganesyan, Yu.V. Rostovtsev, G. Kurizki, “Gamma radiation production using positron annihilation in ionic crystals”, Laser Physics Lett., 12, 7, 2015.